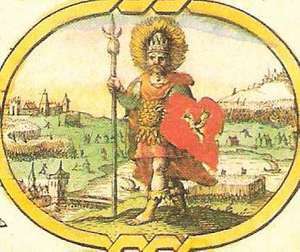 Cerdic, the first English monarch, from an artistic depiction dating from 1611. Language serves the purpose of providing us with a map of abstract reality. Therefore, political terminology serves to achieve the aim of politics, and that is, according to Carl Schmitt, the art of recognizing and neutralizing the enemy. In other words, it establishes a friend and foe dichotomy. To have a political enemy, you have to give him a name. With such dualistic tendencies of our abstract thinking, it is no wonder that the vast spectrum of all possible political attitudes is cut in half by the overgeneralizations of the Left and Right. The practical applications of Left-wing or Right-wing politics are definitely not static: even their core ideas seem to change from generation to generation. There is no reconciling center between them: at least not any that is permanent. I am convinced that Hegelian dialectics, the thesis/antithesis dichotomy which is overcome by a synthesis, is not at all appropriate here. Hegelian dialectics perhaps may be used to solve highly abstract philosophical problems by those few who are specialized in doing so, but they cannot be applied when we try to understand the political dynamics of electoral democracies. The Left and the Right, whatever they are, are two sides at war. We can see how, over the decades, both sides try to pull the public discourse in their favor. Yes, there is a Center, a moderate position – yet this position is not at all fixed, but moves towards the side which is more successful in normalizing its ideas. More than a place of reconciliation, the Center is a position of truce. Somebody who is a centrist on social issues nowadays would be yesterday’s Leftist extremist. Let this not fool us into believing that some Universal Spirit is at work here, moving mankind towards some future universal Omega-point utopia. Dialectics are usually used as a narrative tool by the Left, but, as I have seen during the recent migrant crisis in Europe, the Left is capable of quickly dropping this concept if it fails to influence the development of public opinion in its favor. Now, when we see that the vague Center is like a bride that is being abducted by two rival grooms, it should be clear that it has barely any value in itself. On the other hand, the extreme Left and the extreme Right can at least be respected for holding fixed and concrete ideas, even though they both have to disguise their agenda when trying to apply it in real-life politics. Still, their ideological war is just as real as its mechanisms are concealed from the average eye. It is the aim of my article to examine the essence of Right-wing political thought, and what the White Nationalist movement, or some individual White Nationalists at least, can gain from a radical return to what historically were the most central ideas of the Right. That being said, please keep in mind that I do not denounce appropriating certain Left-wing stances, such as those on economics, as will be discussed later. Yet, what is the essence of the Right? It is highly debatable whether we can take fascism to be the “purest” historical manifestation of the ideals of the Right. It is likewise highly debatable whether Giorgio Locchi was correct in his Essence of Fascism (L’Essenza del Fascismo), where he claimed this essence to be “Nietzschean-Wagnerian surhumanism.” This surhumanism, contrasted with egalitarianism (I can definitely accept the refusal to speak about non-egalitarianism, as it is a purely negative term, while surhumanism – centered around the idea of the overreaching man, overman, surhuman – has at least some, even if fantastical, positive connotations), is still just a Right-leaning historical reaction to the bourgeois democracies that emerged in the nineteenth century. In other words, Nietzsche’s surhumanism is a reaction to the decline of aristocracy. And, as we know, the terms Left and Right came from revolutionary France, where the Left denotes the democrats and the Right denotes the defenders of the Ancien Régime. One might regard the French Revolution as a cultural, political, and religious catastrophe, yet it is my conviction that it was necessary. To quote Evola, “the plebeian masses would have never been able to make their way into all the domains of social life and of civilization if real kings and real aristocrats had been in power.”  It is my belief that the essence of the Right indeed lies in aristocracy. However, the late decadent European aristocracy can in no way be seen as a representative of the ideals that I desire to see realized. These ideals have no connection to the way in which aristocracy as a political class ended, but only to the way in which it started in the first place. So, how did aristocracy start? There is a common misconception that aristocracy began in prehistory, when a certain violent group of people desired to dominate their fellow men. After the stronger man spared the weaker, leaving him with his life at the price of his freedom, aristocracy and serfdom were alleged to be born. This is the root of Hegel’s myth about master-slave dialectics. These dialectics, according to Hegel, negate themselves by the fact that the slave, following his submission, wasn’t even free to give the master his consent. The aristocrat paradoxically lost what he was fighting for – his fellow man’s recognition – by forcing the bondsman into a state where he could no longer authentically give it. This narrative is, of course, mostly a Leftist fabrication. It is correct to search for the roots of aristocracy in prehistory. Prehistoric groups found themselves in many critical situations, either fighting other groups or harsh natural conditions for survival. In times of crisis, those who were ready to show resolve and leadership and were able to overcome a crisis were those who would later turn into the aristocratic class. They had the talent and skills to mobilize people and resources for the defense of their community. As Evola puts it, it was not the aristocrats who were in need of common people, but the other way around: the people needed their aristocrats. They needed them not just as protectors, but indeed as a visible embodiment of what is most divine in man, and of what is most intense in life – for their ability to “carry the flame of heaven down unto men.” Contrary to the Leftist myth, aristocracy was not born from contempt for the common people and out of a wish to dominate them. It was born from man’s love for his kin and the ability to protect them. Indeed, this is what made the original aristocracy godlike, and what made their recognition authentic. When the warrior aristocracy degenerated into a caste of well-heeled, fashion-obsessed wimps wearing wigs and stockings, it was not a surprise that society started to view them as parasites and eventually got rid of them. The relationship between the first aristocrat and the rest of society – between the hero, the savior, and the saved – had already been long gone, for many generations. Yet a classless society was not established, nor can ever truly be so, as the masses will always need a leader, a few who are elected to stand before them and lead them, even if this “elite” calls itself a Communist Party. With the caste system gone, different values had to be adopted. What happened is that these adopted values were, in the end, not those of the common people who spilled their blood, but those of the bourgeoisie. These were actually the values of a class quite distinct from that of most of the common folk, yet these values were declared to be valid for all, forcing everyone to submit to the reality of the market economy. However, these mercantile values are predisposed only for a man of certain qualities, and may, from a different point of view, be seen as discriminatory if applied universally. Now, we all know that in a society dominated by mercantile values, alienation, and atomization, rootlessness and social confusion prevail. The archetype of a merchant is that of a nomad: he travels from place to place, not really belonging anywhere. Everything for him is interchangeable and reducible to its monetary value and subject to the forces of the market, including culture. Culture necessarily deteriorates in such a system, because the commercial imperative demands a constant psychological stimulation of the people’s lowest sexual and materialist impulses in order to keep them buying and to keep the consumerist machine properly running. The traditional values of the masses are never openly persecuted, but under such a mercantile ethic, they corrode anyway. Oswald Spengler shows us that the last civilizational phase is marked by the removal of the values of the mercantile class. This is carried out when the masses perceive a crisis and require a strong charismatic leader, a “Caesar,” to step in. This is the psychological core of the Trump phenomenon. One considerable element that led to his victory was an atavistic, almost primordial desire by the working classes for, not only the return of a king, but also a clear symbol of a civilizational center. The ideologies of the Third Way were based on a similar psychology, just as were the ideas of the German Conservative Revolution, which called for a return of radically traditional values as well as socialist reforms in the economy. They were in fact proposing an alliance of the “spiritual aristocracy” and the masses against the bourgeoisie. The economic dimension of capitalism is not the worst thing about it. Capitalism is not just an economic system, but also an anthropological one that views man as an isolated individual, nothing more than a consumer and a producer, and as just another wheel in the machine which generates the gross domestic product. People, if they can perform their economic roles, are viewed as entirely interchangeable. Such a view of man, again, leads to social deterioration, atomization, alienation, and so on. Yet people still adopt bourgeoisie and progressive stances. (Note that progressivism is nothing more than the jester of capitalism, a completely malformed Left-wing ideology which, instead of persecuting the mega-rich, rather divides the people – men against women, ethnicity against ethnicity, one artificial identity against another, and so on, therefore becoming an ideological ally of its former worst enemy.) Being progressive is seen in some circles as a virtue and as a badge of belonging to the better part of society, the one which does not feel “threatened” by losing its “privilege.” Yet this can be psychologically deciphered as a silent contempt for one’s own roots and one’s own ethnic kin, who are seen as “white trash” replaceable by any foreigner capable of doing their job. From what I can see, a majority of the common people, at least here in the eastern part of the European Union, have the feeling that “something is terribly wrong with society.” The destruction of our cultures is not openly declared, but it nevertheless is progressing, slowly and with low intensity. Unfortunately, people tend to choose safety and keeping their mouths shut over taking any kind of risk, even in terms of simply and openly demanding a change of the course in where our civilization is headed. Even if one is terribly socioculturally oppressed, the common man will most often not accept any danger and will not openly fight for himself – perhaps because he does not know how to do it. At the end of the day, having a beer while watching a football match makes his demise seem bearable. This is where the essence of the Right – that of integrating heroism, personal responsibility, and forging a future worth having into one’s lifestyle – has to step in. In the opening scenes of Goethe’s Faust, the main protagonist analyzes the theological notion which holds that “In the beginning was the Word.” Goethe concludes that this choice of words is not quite correct, and claims that it would be more proper to say that “In the beginning was the Deed.” Societies were not spawned by logos, but rather by mythos. Words without acts are empty. Debating in echo chambers never saved anyone – swearing behind closed doors is what the common people, the ones waiting to be saved, do. The hero prepares for the clash and steps out to face his enemies. The fact that these clashes today consist of competitions in rhetoric and charisma changes nothing. In his On Heroes, Hero-Worship and Heroism in History, Thomas Carlyle demonstrates how the notion of the hero has changed over the ages: from a warrior and a divinity “down” (?) to a priest, a poet, and a man of letters. Yet if I were to define the universal essence of heroism, I would say that it is the ability to take risks on behalf of others, the courage to openly undertake danger, possible persecution, or even death or worse. The prehistoric threat posed by the wilderness or by enemy tribes has transformed into today’s threat of social ostracism, losing one’s job, being spied upon, beaten up, or possibly even put in jail: but the essence is still the same. One has to stand for what he believes in, to risk utter personal defeat, for only this opens the path to true victory. At the end of the day, courage and well-performed actions attract others much better than any theoretical and well-researched analyses. It is my belief that the current global system is absolutely unsustainable. All populations except those of the West (and of the Far East) are exploding. If Third World countries desire to achieve the level of material prosperity of the West (an indeed despicable wish to have, but still, alas, very tempting), we might see a world revolution of the underdeveloped countries against the developed ones as soon as the first larger crisis hits. Yet before that day of great deeds (if such a day ever comes), I would like to give a word of warning to the would-be-heroes of the West: don’t be stupid, and avoid being counterproductive. Counterproductive behavior caused the demand for securing a future for white people seem like an extremist slogan, and therefore paved the way for an ideology making our demise seem like an implicitly welcome outcome. I believe that the dilemma of the common man today is this: “The current regime is going to destroy our culture and our nations in the long run, yet there is nothing we can do about it, as there is no alternative: or actually, the only alternative is Nazism, and we don’t want that, do we?” One will most surely be denounced as a “racist, fascist, xenophobe,” and so on, and that must be contended with. Yet it is my belief that deep down, the common people know that a major shift towards nativism is right and necessary. One has to denounce hatred: it has to be widely understood that multiculturalism is not just bad for us, but even more for the uprooted, alienated migrants. For the time being, words have to be used as a tool of our mythos: words have to prepare the metapolitical landscape for what will have to be done later. We are still in the stage of a cultural war. Some may see me as contradicting myself, going back from deeds to words, yet even words of truth can be revolutionary. One has to adapt a Gramsciian tactic, being actively involved in practical life as a builder and an organizer, and being always persuasive and unapologetic for what one holds to be true. It may sound simple, but it will cause you a lot of problems and make you a target for hate and (oh, the irony!) prejudice. There is always something that can be done to effectively advance the message. There is always something one can do to become a better man. There is always something one can change so that the public will not view you as a monster. And getting serious in this endeavor will guarantee you a life of adventure and higher intensity, and that is as much creative heroism as the Kali Yuga has to offer. Julius Evola, Revolt Against the Modern World (Rochester, Vt.: Inner Traditions, 1995).